Treatment for dry eye syndrome can help control the uncomfortable symptoms, but there is no actual cure. Those who are affected with this issue may have recurring episodes throughout their lives. The exact treatment for dry eye syndrome depends on whether the underlying symptoms are caused by decreased production of tears and these may evaporate too quickly. Your doctor will consider and consult about other factors, including any medications you may be taking, which may increase your symptoms. Your GP can prescribe treatment or refer you to an appropriate specialist. You can also help prevent dry eye syndrome or ease the symptoms by adjusting any potential environmental causes such as keeping your eyes clean and improving your overall diet. What About Dry Eyes and Air Travel? 1. Hydrate! Dehydration, even to a small degree, can exacerbate dry eye symptoms. Keep clean , fresh water on hand to continually hydrate, before, during, and after your flight. Your skin will thank you for it as well. Alcoholic beverages and caffeinated drinks increase dehydration so iy plan to indulge and enjoy these beverages in-flight be sure to drink extra water to compensate. 2. Proper artificial tears are an excellent defense against dry eyes. Keep a bottle of doctor recommended artificial tears with you for your trip to apply continually. If you have even experienced chronic dry eyes be sure to discuss your travel solutions with your doctor. S/he may advise an effective lubricant for your travel needs. 3. Sleep while in transit can easily enhance your dry eyes effect. 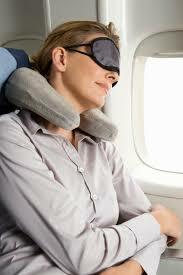 If you nap in the air, wearing an eye mask will minimize the dry air surrounding your eyes during sleep. This will reduce dry eye problems. Have you been told that you can never wear contact lenses? If you wear contact lenses, be aware that many brands of artificial tears cannot be used during contact lens wear. You may need to remove your lenses before using these drops. Wait 15 minutes or longer (check the label) before reinserting them. For mild dry eye, contact lens re-wetting drops may be sufficient to make your eyes feel better, usually with a temporary benefit. Switching to another lens brand may help. Check the label, and check with your doctor before buying over-the-counter eye drops. Your eye doctor will know which formulas are more effective and longer-lasting, and which eye drops are best for your specific contact lenses. To reduce the effects of sun, wind, and dust on dry eyes, wear sunglasses when you are outdoors. Wraparound styles offer optimal protection. With proper diagnosis and treatment we can better advise and help you. Learn about treatment for Dry Eye! Call Our Office to Set Up Your Exam, Today!